Hi, this time I am writing from Canada because we came to celebrate the Holidays with the family. I have prepared a nice "cocktail de camarones y ostiones" (Shrimps and oysters cocktail) that everyone has loved so I decided to share the recipe with you. This can be the first course for a nice meal. 1. In a bowl put the chopped onion, tomatoes, chile jalapeño, cilantro and the avocado. 2. Add salt to taste. 3. Add the lime juice, the olive oil, and the ketchup. 4. At the end add the shrimps and the oysters. 5. Mix all the ingredients smoothly. 6. Serve in small bowls and decorate with a slice of avocado and a leave of coriander. Everyone adds the hot sauce to taste. Normita and I wish you the best for Christmas and we are very sorry for not posting any updates in the past few days. We have been very busy with family matters and we will try to resume posting by next week. Have a great time and we will be back with lots of new recipes and interesting news soon. Posting will be light for the next day or two as I am not in the office these days with access to all my resources. Hopefully things should go back to normal by tomorrow once this hectic period will be over. Until then enjoy yourselves and don’t party too too much. While I was going through my notes of what we recently cooked I remembered that I did not post the main course from when we had company last weekend. 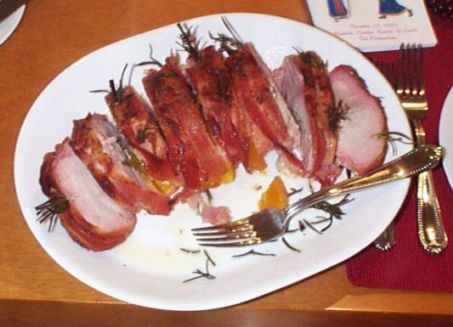 It is a very simple dish that is a nice solid main course for a small group of people like 2 couples. 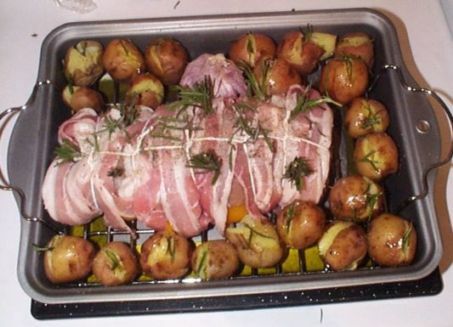 You can prepare it and put it in the oven and forget it for an hour or so while you are enjoying the company of your guests, then you just need to prepare the sauce quickly and carve it to get ready for the table. With a minimum of preparation and fuss you have a nice main course. We served it with a nice bowl of mixed lettuce with a simple dressing of some herbs, olive oil, and sherry vinegar, and a few chile de arbol. A quickly prepared feast for the holiday season. We served the roast with a young (2004) Chilean red wine called Trio that is a blend of cabernet sauvignon, shiraz, and cabernet franc. A lot of people are intimidated by wine tastings and ask me why I do it. The answer to why I do it might be slightly different than the average person’s reason, but one thing should be consistent to all is that the main reason should be pleasure. The actual goal of a tasting might vary greatly between individuals, and I normally separate the tasters in two main categories. The professionals who do this for business and the rest of the world who should be doing it for the pleasure of discovering new wines or of revisiting old friends. The approach of each individual varies greatly and the pros tend to take standardized notes that can be revisited years later to follow vintage trends, or the development of specific wines. Of course those who attend tastings strictly for pleasure can also take copious notes, as they are very useful, but note taking and using esoteric terms is not a prerequisite for enjoyment. Trying to find out what you like in a wine and enjoying the experience should be the main goal. If you do not like a particular type or style of wine, why go to a tasting of those wines? Of course, as a professional, you might be called in to taste and evaluate types of wines you are not too fond of, or at times or locations not conductive to tasting. I remember that 20 years ago I was attending lots of tastings to blend some wines in Eastern Europe and the managers of the estate insisted that we met at 7am to do the work as later in the day they were too busy. 7am after a long night of meetings is not a fun tasting experience, but it is part of the routine of a pro. We will not emphasize this side of the business here, as we will concentrate in the hedonistic aspects instead. In the coming weeks I will start going through the basics on how to approach wine tasting and get the most information and pleasure out of them. I will also go through the mechanics of it and explain some simple terminology. As with any human endeavor wine tasting has its own jargon that can seem off-putting to people new to the field, but there is actually a good reason to some of it as you need to standardize you vocabulary so that you are able to describe a sensory experience consistently enough that other people can relate to it, and so you can also go back through your notes and revisit tasted wines so that they have a meaning for you even years later. As mentioned above the main reason one should be formally tasting wines is for pleasure, and also to find the wines that you like best. Other reasons are only ancillary to the process, but for some people they could be the most important aspect. Like a lot of things in life relating to sensory experiences, there is no good or bad ways and reasons to do things. I am finally catching up with work enough to start posting regularly. It has been a hectic last week and to get back into the heart of things here is a nice recipe that I have adapted from one of Normita’s. It is simple to make and is a great addition to the holiday table. I noticed that when it is freshly baked it has a tendency to be a little dry, but if you wrap the cake in aluminum foil for 3-4 days it ripens to perfection. If you want an extra special version you could soak a piece of clean cheesecloth with a few tbs of Grand Marnier and wrap the cake first in the soaked cheesecloth before wrapping in foil. To bring this to the next level you could also inject a small quantity of Grand Marnier all over the cake with a basting syringe on a daily basis for 4-5 days before serving. This will yield a very flavorful alternative to fruit cakes that people will actually eat. The Padrino is leaving at the end for the afternoon so I will get back to business shortly. Later in the day, if I can manage to finish catching up with work, I should be posting a new recipe. 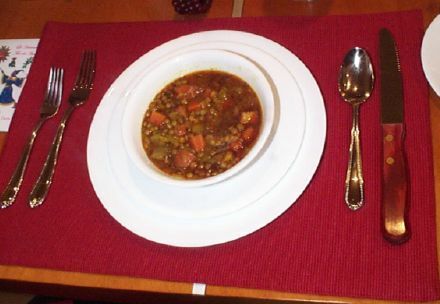 In the meantime here is a nice picture of the lentil soup from recipe that we posted last week. As usual I cannot leave alone a recipe as written. I wrote it 2 days ago and I have already made some changes as I was preparing it for the first time. The recipe bellow is the version that is now making me very hungry just by its smell. I hope that you will try it, and let me know if you like it. Now I have to go get ready for the trip to the airport in heavy traffic. 1. Put olive oil and butter in a large soup pot. Heat over a high fire until butter is melted. 3. Add the garlic and ginger and sautÃ© for a few minutes more. 4. Add the carrots, spices, and herbs and mix well with the ingredients already cooking. 5. Add the chicken stock and cooking sherry. 6. Stir in the lentils. 7. Bring to boil over high heat, and then simmer on medium/low fire for 45 minutes until the lentil are cooked stirring occasionally. 8. Put a tbs of brandy in the bowls in which you will serve the soup. 9. Serve with a squeeze of fresh lime on top. Yesterday I hinted at the topic I will to discuss today. What kind of wines should somebody, who does not want to invest a lot of money into a wine cellar, keep at home for regular consumption and for culinary emergencies? There is no unique answer to the question as it depends on individual tastes and on where each and every one of you is located. One thing to first look into is what is readily available where you live. There is no need to find a special wine for daily consumption and having no ready supply nearby. If you have to drive across town to get a few bottles of your favorite wine, then you might be better off to buy a few cases and cellar it and this is another story entirely. I am talking here of having a ready supply of wine at hand to drink occasionally and to help if you have unannounced guests coming in at the last minute. Let’s put an upper limit to our fictitious kitchen cache at about a dozen bottles, what most small wine racks or built-in wine storage areas would hold. We will talk about cellaring another day, but today let’s focus on what those dozen bottles should be. First, think about what you like to drink yourself and also about the taste of the people in your social group. Do you prefer red or white wines? Is your taste for the more robust styles, or for the light and fruity? This should point you to the types of wines you should keep at hand. Remember we are talking here of wines for daily consumption, so lets not concentrate for now on those special bottles that we keep for special occasions. We want to look at wines that are good to drink now and that you will need to drink in the coming year for them to be at their peak. The first thing we need to look into is price. I cannot quote a specific price as each geographical market play by its own rules. There are some general rules of thumbs, in most markets, that we will look into that will help in making the right choices. In most markets there are the low end wines. We are talking here about the price range of the cheapest wines available locally. In some markets they are predominately screw top bottles or bulk packaging like wine-in-the-bag, or TetraPack. Strangely enough, in our neighborhood of Mexico City, the low end is almost entirely populated by cheap Spanish or Chilean wines in regular corked bottles. The new packagings are almost non-existent. For example, those wines are in the USD$2-4 range here. With the exception of a few wines in the high end of this price range, I tend to stay away completely from them. Let’s call that category the ‘Cheap And Awfuls’ (CAA) and try to forget about them for now. The second category is what I call the ‘Cheap And Decents’ (CAD). The first category we looked at are normally not numerous, but the CAD are normally populated by a huge variety of wines. They are normally more geographically diverse, and also more diverse in the varietals types available. In our neighborhood their price tend to go from USD$5 to USD$8. This is the category where we will concentrate our search in. The third category is what we will call the ‘Cheap And Premiums’ (CAP). There is normally a price gap between the CAD and the CAP wines, and normally they are less numerous in most stores. In our local market we are talking about wines in the USD$10-15 range. A lot of time they can be premium bottlings from the same producer as the CAD. Of course there is a lot more wines available at higher price, but let’s not look at them for now. Instead let’s look at the CAD wines where you will normally find the most value for your money. Once you have figured out what price are the CAD wines in your neighborhood, look around if there are any that you like in the lot from past experience. You can ask for advices if your store has properly trained staff that will know their products instead of just point you to what management wants them to push at the time you ask. If not on both counts, then pick some bottles at random. You will never know what they taste if you do not try them. Based on your personal taste, and since the prices of those wines are pretty low, select a few different bottles to try. Over the next days try the bottles you brought back home and see if there is one that stands out, and that you like a lot. If so note it down. The following week pick up a few new ones and one of your favorites from the previous tasting. After some weeks of doing this you will be able to find some wines that you like, and those will be the ones that you should use for your kitchen cache. As you can see this type of wine tasting will not break your budget, and can be real fun to do. We are not talking here about taking extensive tasting notes using esoteric terms, but in finding which wines you drink you like the best and want to drink again. This is the core of what tasting wine should be. Pleasure is at the forefront of the experience. After a few months of fun tasting what is available locally, select a variety of wines for you kitchen cache to suit your needs. If you are like me and have a very eclectic palate and normally like most types of wines, you should try to select various wines to match different situations. As a rule of thumb I would keep in the kitchen a few bottles each of robust red wine, lighter-fruiter style red wine, sharp and acidic white wine, and of fuller and fruiter style white wine. Add to that a couple bottles of dry sparkling wine, a bottle of sweet fortified wine like port for after dinner, and maybe a bottle of cooking sherry and you have a perfect and useful kitchen cache that can provide wine for daily drinking and to cover most needs. Don’t forget to replenish your cache whenever you open a bottle, and you will never have a wine emergency again. Later we will discuss some suggestions for the various categories and styles of wines and start discussing wine selection in more details. In the meantime enjoy your weekly wine tasting and the pleasures of setting up your kitchen wine cache. Years ago I remember that some friends were amazed that we had talked one afternoon at work and when I learned that they had no specific plans for their wedding anniversary that night, I invited them for a nice meal at home and prepared everything from the time I left work at 5pm to the time they arrived at 7pm, and this included shopping for the food. There was nothing amazing in the process, and all it took was preparation and organization. Knowing your limits also helps. If you like to entertain at home like I do, you always end up with some failsafe recipes that you can always whip up at a moment’s notice. If you always keep the basic ingredients at hand and you have made the recipes many times before, you can easily make a nice meal after simply shopping for perishables you might not have at hand. This is exactly what I had done that evening. I do not remember exactly what I had cooked, but I remember running across the street from my office to pick up some small shrimps for a seafood first course, then to the butcher for a nice piece of meat, and throwing together some blueberry desert with some nice blueberries I picked from the over 50 acres of brush I used to own at the time. It also helped to have a well stocked wine cellar with a few thousand bottles where I could always match what I was planning to cook with one or many different wines. Like everything in life it only takes a bit of practice and confidence to end up with great results. Another thing that you should do is to always think about what you can do with what you have at hand in your house. One of my favorite things to do in cooking is to look into the refrigerator and see what we can put together with whatever things we have laying around, including leftovers. At times it can be a challenge, but it keeps you culinary mind well exercised. One thing to remember though is that if you are planning a special event where you want to show your best, do not try to do a new recipe for that event, unless you practice it first. Not doing so would be asking for big trouble. I have never met a new recipe that I have not fiddled with to make it work the way I like. The time for the fiddling is when you are relaxed in your kitchen and do not have a bunch of guests to attend to. 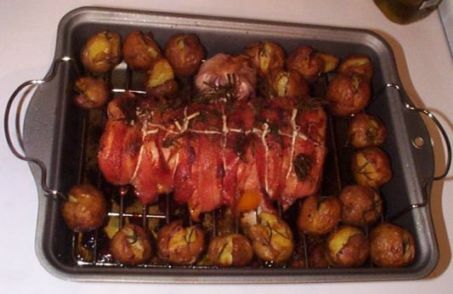 Unless you have lots of experience you should not try to improvise something for that special meal. ‘Iron Chefs’ antics should be left to the pros, and even for them the results can be very hit and miss. Saying all this, I wrote a new recipe today for a lentil soup that I plan to serve on Saturday when special friends will come over for supper. I am pretty sure that it should come out well, but in a way I am contradicting all that I have said above. The rest of the meal will be tried and true recipes though. I really do not have time to try the new soup beforehand, but I will probably make it either Friday afternoon, or on Saturday morning so if things do not go as planned I can always prepare something else or try to fix the mess without the pressure of our guests being there. So remember the following, if you have to do something special at the last minute, do some of you favorite recipes that you are comfortable with. Try to have most of the ingredients for them always at hand, so you have to buy a minimum amount of ingredients at the last minute. Always keep at hand a few bottles of red and white wines of different types so that you have something that can match most dishes without having to run around for wine at the last minute. We will talk about what type of wines to keep at hand for regular and/or emergency consumption in the coming weeks. If you have a bit of lead time and want to try a new recipe, practice it before to make sure that it turns out as you expect and you do not run into major problems with your guests waiting at the table. At least, do as I will do next weekend, prepare it with enough time before the guests arrive to be able to cook something else or change the recipe without being under pressure.